Elden Root is found in the center of Grahtwood, within the region of Green Hall. A river from the northeast flow down into the Elden Root basin, and forms in a lake that takes up the eastern outskirts of the city. All around the city are Ayleid ruins, reminiscent of the Ayleid migration that came into Valenwood. These ruins are largely inaccessible, save for the inner caverns of Elden Hollow, where the ruins are found in the shadow of the city, in the southwest. Beyond the outskirts lies the ruins of Root Sunder, one of the earliest examples of colonization of Grahtwood. But it has since fallen into disrepair. That road found south of Elden Root, and near Root Sunder leads into the region of the Long Coast, Grahtwood's coastal region, which contains the cities of Haven and Southpoint. The northern roads lead into the rest of Valenwood, towards the borderlands of Reaper's March, or deep Valenwood, beginning with the Tarlain Heights. This area is where signs of the Wood Orcs begin to show, as seen with the settlements of Goldfolly and Reman's Bluff. West of Elden Root is two well-known sites, the Falinesti Winter Site, and the ruined city of Gil-Var-Delle. Elden Root is neighbored by several settlements, including Archen Cormount in the southwest, Lynpar March in the east, Meadow Run in the west, Moonmont in the north, and Wasten Brukbrook in the southeast. As mentioned before, Elden Root is surrounded by the Elden Tree, which makes up most of the settlement. At the highest branch of Elden Root lies the Throne Room, the city's seat of power. Members of the Camoran Clan had ruled from Elden Root through the Throne. Descending downward leads into the Great Trunk Artisans Court, where various craftsmen made their business. Branches that diverge from here lead into local guilds such as the Fighters Guild and Mages Guild, as well as the Throne Room. Downward into the ground level are many merchants and caravans, as well as the local shrine of the Spinners. The land outside of the ground floor is occupied by tree-pods and foreign architecture, such as the Altmer Embassy. Access to the Ayleid ruins are found in the backside of the Elden Tree, and the entrance to the Orrery is found along the main streets. The Elden Root Outlaws Refuge utilizes the Ayleid ruins underneath the Elden Tree, which was excavated by the outlaws of Grahtwood. The city was probably founded during the late Merethic Era or soon after King Eplear, a Bosmer warlord, united the tribes of Valenwood under his rule, an event traditionally regarded as the beginning of Year Zero of the First Era. The settlement grows around the Elden Tree, an enormous and ancient graht-oak commonly believed to have seeded all of Valenwood. By this time, Elden Root was a small inland trading post in Grahtwood with little political significance as the royal capital was located in the walking city of Falinesti. After 1E 242, when the Daedra-worshiping Ayleids were driven from Cyrodiil after the Alessian Slave Rebellion, many of the Wild Elf clans took refuge in Valenwood. One of the foremost of those clans was granted the right to excavate dwelling-halls under Elden Root itself. The clan who settled below the Elden Tree first came to the Elden Root led to it by Meridia's shining colors, which told them this was her gift and blessing. Among the Ayleid refugees, was the arch-mage Anumaril. Before coming to Elden Root, he created the Staff of Towers, composed of eight segments, each corresponding to one of the metaphysical Towers. No sooner was the Staff constructed than it was separated into eight pieces, seven of which were taken to far corners of Tamriel and the eighth, made in the image of White-Gold, Anumaril himself wore as a femur while walking to the Tower of Green-Sap, the Elden Tree. Below it, he located the Stone of the Tower, the Perchance Acorn, and built an orrery around it, attempting to convert Green-Sap into another White-Gold to restore the Ayleid empire. This attempt failed, due to a fundamental incompatibility between Ayleid and Bosmer magic and belief, but its work remained hidden below the city. In their underground settlement, the Ayleids built a university and great libraries in and around the Tree before the city they have built became abandoned when the Wild Elves assimilated into the neighboring Bosmer society. The ruins came to be known as Elden Hollow, which was later used as a burial ground for generations of Centaurs and Minotaurs. During the Second Empire rule of Valenwood, each of the treethanes of Falinesti, Silvenar, Haven, Cormount, Elden Root, and Woodhearth were given a minor kingdom, rising from local to regional powers. This way, Valenwood was divided into six independent kingdoms ruled by local Bosmer nobility, but under the Second Empire banner and protection. During this time, in which Elden Root treethanes ruled the Kingdom of Grahtwood, the once tiny town grew from a simple trading post into a major city. With the foundation of the Colovian colony of Southpoint in the kingdom's coast, Elden Root got a gateway to the sea which eventually eclipsed the nearby port of Haven. During the Akaviri Potentate, in the early Second Era, the Maormer from Pyandonea launched an incursion in southern Valenwood, landing and sacking Haven and Woodhearth and marching inland towards Elden Root, where they razed the settlement and the very Elden Tree before returning to the sea. In 2E 580, Elden Root was incorporated to the First Aldmeri Dominion along with the rest of Camoran-controlled Valenwood after Blacksap Rebellion was put down by Ayrenn and Aeradan Camoran joined forces. The Elden Accord, signed by Queen Ayrenn, Mane Akkhuz-ri, and King Camoran Aeraden, took place in the city, marking the proclamation of the Dominion's foundation. Elden Root served as the capital of the First Aldmeri Dominion to strengthen the relationship between Altmer and Bosmer. In 2E 582, Ayrenn visited the city to attend to the Ratification Ceremony, a ritual performed in the Orrery located in the Ayleid ruins below Elden Root. The Soulless One helped the Queen of the Aldmeri Dominion to put the ancient machine into work. Legends said the Ceremony can reveal those worthy of becoming emperor or empress. Once the Orrery had awoken, Prince Naemon step forward towards the Ayleid device and used a spell to bind all observers. The powers of the Orrery overcame him, and he emerged from the Orrery transformed into an ogrim. The Soulless One killed the Prince to save the other attendants. Despite Ayrenn shock after witnessing her brother's death, she completed the Ceremony, revealing herself a vision of "A Dominion of peace. The fair and just rule of Tamriel, beneath an Aldmeri banner. A future I hope to build." The truth about Naemon's death was hidden by his sister, who ordered to announced he died as a hero, not a traitor. Elden Root remained in Aldmeri hands until the eventual dissolution of the Dominion, after which, remained as the capital of Valenwood. Soon after the Three Banners War ended, Falinesti returned and the Camoran kings moved to it again, returning to the walking city the title of capital of Valenwood. Elden Root continued to be a major settlement and main city of Grahtwood but devoided of the Camoran Royal Court. Again in 2E 830, the city was annexed by the Second Aldmeri Dominion after the intervention of Summerset in another Camoran civil war. For the second and last time in history, Elden Root became the capital of Valenwood. The Thalmor wanted the Camoran kings to be settled in a permanent city and Falinesti lost its royal status again. However, the catastrophic use of the Numidium by Tiber Septim resulted in the conquest of both the entirely of Valenwood and the Summerset Isles in 2E 896, ending the Second Aldmeri Dominion control of the settlement, which was incorporated to the Third Empire. 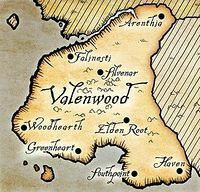 Since the beginning of the Third Era, Elden Root became part of the Province of Valenwood, but the Imperials set Falinesti as the capital of the new province. The city remained in Imperial hands except for the Camoran Usurper Rebellion between 3E 249 and 3E 267. During the Imperial Simulacrum in the late Third Era, Eldenroot was an active settlement, being ruled by Queen Ulandra. It had a rivalry with Greenheart and Silvenar. The Oblivion Crisis that ended the Third Era and weakened the Empire provided the opportunity for the Thalmor to seized the Summerset Isles. In 4E 29, a Thalmor-backed coup overthrew Valenwood's government, routing Imperial forces and their Bosmer supporters. Alinor and Valenwood then proclaimed a union, and a new Aldmeri Dominion was formed. The city fell into Aldmeri hands for the third time in history. Traditional dwellings on the forest floor give way to woven, naturalistic abodes in the graht-oak's branches, connected by mobile platforms that ferry about people and supplies under manual power. It is also common that drunks fall down from the branches of the Elden Tree. Due to its history, Elden Root's architecture is a unique and beautiful intermingling of Bosmer and Altmer styles. The Bosmer of Elden Root throws all garbage out their windows to fall at the roots of their tree-houses and the Elden Tree. This practice is regarded by other folk as revolting and unsanitary, but the locals say they are fertilizing the roots of their beloved trees, but most others just think they are lazy. During the times when Elden Root was the Valenwood capital, Royal Consorts celebrated fetes where highly-ornamented alit bone shawms were played to amuse the assistants. The Greenwarden Forge makes iron utensils respecting the principles of the Green Pact. This page was last modified on 13 February 2019, at 17:13.